Assessment philosophy, pedagogical philosophy, and terms of labor for teachers are interdependent, mutually reinforcing elements of a chronotope. The heavy reliance on contingent labor and corresponding hierarchical administrative structures that characterize so much of the scene of postsecondary writing education fit with more objectivist views of assessment, which can be used to fix writing education in a stable, predictable mold that carries a formalist view of language and presents itself as a-situational, a-ideological. Within this chronotope, all of the pieces work well together. Contingent teachers with minimum qualifications to teach writing are plugged into ‘commonsense’ pedagogical models. These models are maintained through such programmatic mechanisms as standard textbooks and syllabi and ‘one shot’ workshops that aim to train rather than to educate and sustain intellectually dynamic, openended, research-informed conversations about writing education. Assessments can be conducted as unilateral processes that purport to verify programmatic adequacy to administrators through applying a standard rubric to students’ work. The practice of using exclusively quantitative measures that derive singular, aggregate scores keeps the sometimes vast differences in pedagogical stances and quality that operate in actual writing classrooms safely hidden. Scott, Tony and Lil Brannon. 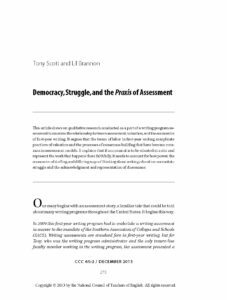 “Democracy, Struggle, and the Praxis of Assessment.” College Composition and Communication 65:2 (2013) 273-298. Copyright ©2013 by the National Council of Teachers of English. Reprinted with permission.